How do I Make Fudge From Chocolate Cake Mix? Learn how to substitute applesauce for sugar in your baking and you’ll have a convenient way to reduce simple sugar content and lend a more complex flavor to your food. 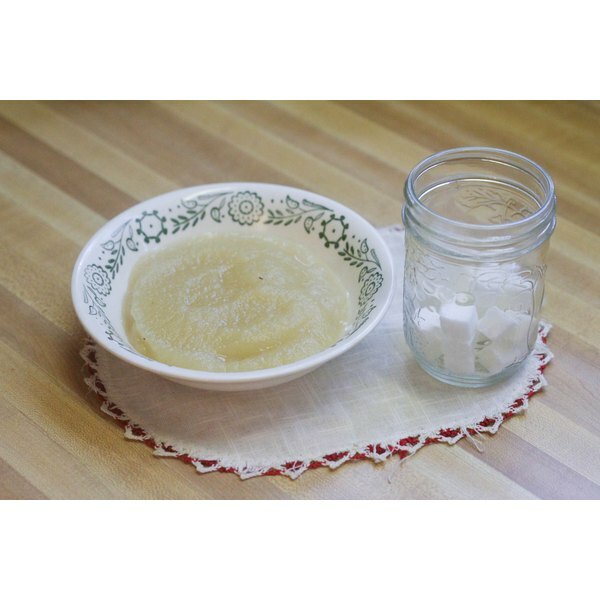 Applesauce contains natural sugars that the body breaks down more slowly than refined sugars. These natural sugars don’t increase blood sugar as rapidly and are less likely to irritate sugar-sensitive people. Although applesauce can change the texture of baked goods, it also adds moisture and a subtle spiciness that blends well with most flavors. Identify the purpose of sugar in the recipe. This will tell you how much of the sugar you can replace. In cold desserts like fruit soup, sugar is just a sweetener. In sweetened side dishes like sweet potato casserole or baked beans, sugar adds both sweetness and flavor. The role of sugar in baking is more complex. Sugar helps aerate and tenderize the food and allows it to brown. Check how much sugar the recipe calls for. Use the measurement of volume, such as cups rather than ounces. If the recipe calls for two different types of sugar, such as white sugar and packed brown sugar, use the combined total by volume. Based on the role of sugar in the recipe, decide whether or not you want to reduce the total sugar used. In most baking recipes, you can reduce the sugar by at least a third without affecting the taste or character of the batter. Measure out the required applesauce. If the food will not be heated, replace the sugar with an equal amount of applesauce. In heated sweet side dishes, as well as cookies, brownies and muffins, you can replace up to two thirds of the sugar. For cakes, however, replace only half the sugar with applesauce. Use about one third more applesauce than the amount of sugar you replaced. For example, in a cake recipe that calls for a cup of sugar, use half a cup of sugar and about 3/4 cup of applesauce. Reduce liquids in relation to the applesauce. Applesauce contains a considerable amount of moisture. You must rebalance the amounts of liquids and solids to prevent your food from becoming soggy. Reduce the main liquid in the recipe, such as milk, by 1/4 cup for every cup of applesauce you add. Add the applesauce. In recipes with no heated ingredients, add the applesauce at the point where the recipe calls for sugar. In a baking recipe, beat the applesauce into the eggs. If the recipe calls for butter or oil, mix the fat into the eggs and then add the applesauce. If the applesauce isn’t sweet enough for your taste, use vanilla or spices like cinnamon and nutmeg to increase sweetness without adding sugar. Applesauce can’t replace sugar in hard-candy recipes. Even unsweetened applesauce contains sugar. If you’re diabetic, use care when deciding how much applesauce-sweetened food to eat.